Kelly Strayhorn Theater – A living testament to the drive and creativity of true American originals. To enter the theater is to be in the presence of two creative and passionate spirits who, with their talent, tenacity, and love of their craft, provide inspiration for us today: famed dancer and Hollywood movie legend Gene Kelly, born and raised in East Liberty, and Homewood-bred jazz composer Billy Strayhorn. Their spirits abound in the young East End artists of today. As the last of nine theaters from the 1950s heyday of East Liberty, the Kelly Strayhorn Theater has become part of the transformation of East Liberty into an extraordinary arts and entertainment destination. In 1914, the Regent Theatre opened as a state-of-the-art 1,100-seat photoplay house screening silent films. Designed by architect Harry S. Bair, The Regent featured a grand theater organ that provided live accompaniment. 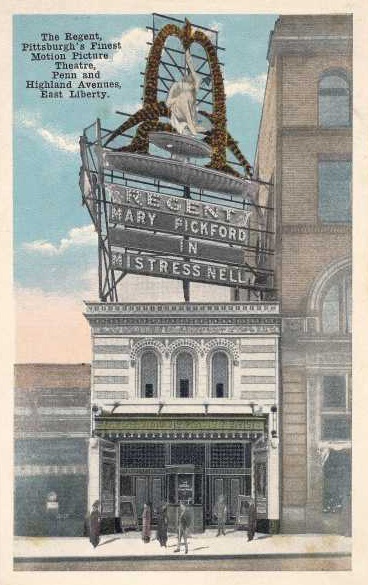 East End residents could catch Mary Pickford or Douglas Fairbanks at the Regent, and enjoy music, more films, and live performances at the many other theaters in the neighborhood, including the Camera-Phone, Enright, Harris Family Theatre, Liberty, Sheridan, and Triangle. Over the decades, the Regent had its ups and downs, and was dark for long periods of time. The first reopening was held on July 18, 1965 following a $175,000 renovation under Associated Theaters, a group lead by Ernest Stern who also owned the Encore, Fulton (now the Byham), Gateway, and Forum theaters in Pittsburgh. At this point the Regent’s capacity was reduced to 850 to provide increased patron comfort for the first showing of In Harm’s Way with Kirk Douglas, John Wayne, and Patricia Neal. Former patrons report that young people would spend Saturday at the Regent where they could enjoy animated features and action-adventure movies all day. In October 1979, the Regent closed again. By the 1990’s, the Regent was poised for renewal, as was the neighborhood. Pittsburgh’s downtown cultural district was underway, but Pittsburgh needed another mid-sized venue to welcome small arts groups and community programs. The arts community gathered for a sneak peek fundraiser to support the possibilities, including a gallery of local stars provided by the East Liberty Chamber of Commerce. Shocking is the word to describe the long line of people waiting to buy tickets outside of East Liberty’s Kelly Strayhorn Theater. Apparently, the word was out that the Black Theater Dance Ensemble was returning to the stage after nearly two decades. By 2009–2010, the Kelly Strayhorn was in use more than three-quarters of the possible performance and rehearsals days as young performers, dancers, filmmakers, actors, musicians, community organizations, and audiences participate in the ongoing renaissance of East Liberty’s performing arts center. Patrons step over a commemorative Walk of Stars, recognizing artists, friends, fans, and family members when they arrive for an event. The marquee lights signal anticipation of the next show and the neon signature of the namesakes sparkles all night long. In 2015, the Kelly Strayhorn celebrates its fourteenth season in operation, and its eighth season of original programming. Today, we look to the future with anticipation for the opportunities we’ll create together for the performing arts and our community. History is an ever-growing story. As we confirm research and gather stories about the Kelly Strayhorn Theater, we look forward to sharing the facts, legends, stories, and more. If you have stories or information about the theater as we approach our venue’s centennial, we would love to hear from you. Contact KST via info@kelly-strayhorn.org.